The four decade-old trend of declining interest rates seems to have ended a few years ago, given that lows reached a few years back, likely represent the bottom. Given that global debt/GDP keeps rising, the importance of ever-declining interest rates in order for us to be able to service debts is not fully understood and appreciated. Given that there is no way to provide the global economy with further interest rate relief to make up for higher debt, a long period of debt deleveraging awaits us. 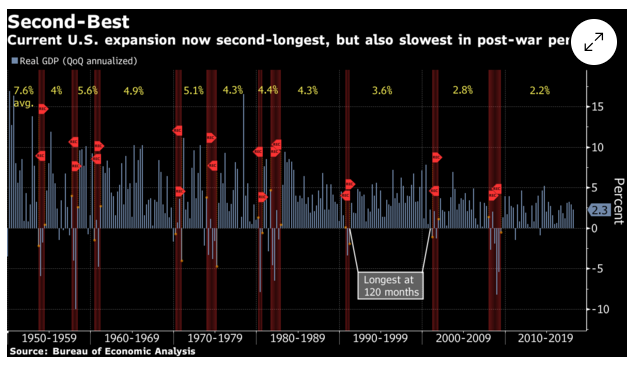 With the second-longest recorded economic recovery still going strong, perhaps beating the old record there are many people wondering just what will derail it, given that at some point it will end. My bet for the past few years has been that it will probably be the result of an oil price spike. Although oil prices did recover significantly since the early 2016 lows of under $28/barrel for WTI, an oil price spike is yet to materialize, which is why we are still talking about the on-going economic recovery, which started in 2009. While I still believe that an oil price spike is a prime candidate, I also think that if the current recovery will go on for long enough, there can also be another major candidate, namely rising interest rates, which might in fact lead to a new global economic crisis, which could be far worse than the last one. In effect, the debt deleveraging process that we all expected but did not materialize the last time around will most likely happen starting with the next global economic downturn. Any look at a global debt chart from the past few decades would lead on its own to a conclusion that we are headed for major disaster. As we can see, global debt levels have tripled since 1999, which on its own seems rather scary. When we factor in the fact that global GDP has also doubled in the same period, from $32.5 Trillion, to over $75 Trillion by the end of 2016, it does not seem as scary anymore, except for the fact that debt is growing at a much faster rate than the economy. It is not always easy to ascertain whether higher debt as a percentage of GDP is the result of declining interest rates, or whether interest rates were pushed down in order to accommodate the growth in debt. My personal view is that it was the latter and everything was done in terms of monetary and government policies in order to facilitate the constant decline in interest rates for the past four decades or so. It had to be done in order to keep global growth, but especially developed world growth from stalling out. One thing that is certain is that if interest rates would be as high as they were in 1980 or even 1999, we would currently be in deep trouble. We have no way of calculating the global interest rate on all debt, but if we were to assume for comparison's sake that interest rates on total debt were to average 10% back in 1999 and now, it would have cost about $8 Trillion to service the world's debt back in 1999, while in 2017, it would have taken about $24 Trillion. As a percentage of GDP, it would have been just under 25% in 1999, while in 2017, it would have been about 32%. For this reason, whatever the average interest rate was in 1999, we certainly cannot go back to that ever, as long as we do not get back to a debt/GDP ratio that is similar to what we had then. While it is impossible to measure global interest rates, at least for non-institutional entities such as myself, we do know that average global interest rates are now much lower than they were in 1999. Just to give us a perspective, we can look at one individual component, namely average US mortgage rates for the past fifty years or so. Today's rate is just above 4.5%, but it has gone even lower in the past few years, to as low as about 3.5%. In the early 1980's however people were expecting to pay rates as high as 18%, as we can see from the chart. I think most of us have a good idea in regards to just how much house we could afford today if interest rates would currently be early 1980's levels, therefore we can all get an idea in regards to the importance of the lower interest rates we enjoy today. I think it helps to look at the growth in total mortgage debt since the early 1980's to get a better understanding. Since 1980 when total mortgage debt surpassed $1.4 Trillion, we increased our mortgage debt load by more than 1,000%. Of course, there are also 50% more households and non-adjusted household income is also much higher, but not nearly that much higher. 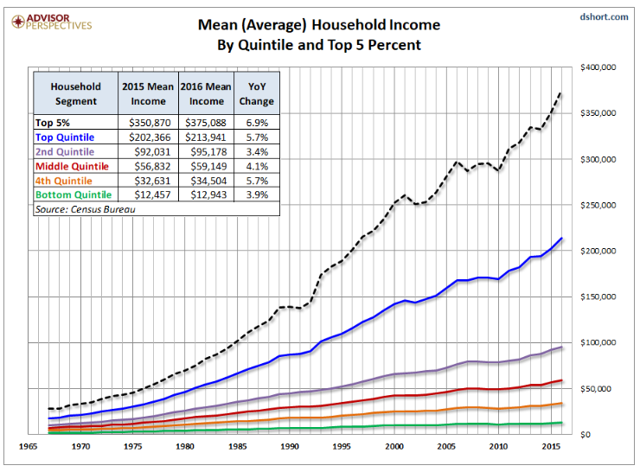 Since 1984, only the top 5% of household earners came relatively close to keeping up with the increase in mortgage debt growth, with incomes increasing by more than 500% in non-adjusted terms. When factoring in the growth in number of households, of 50% we can say that the top 5% could still afford about as much house as they did in 1980, with some adjustments in spending habits. Growth in collective income of the top 5% is in fact about 750% higher, therefore it falls only slightly short of the increase in total mortgage owed. We should note however that it is more than likely that far more household in this income bracket most likely have their mortgage all paid up compared with the other 95% of households. Everyone else does not come close to keeping up with the growth in mortgage debt, with the bottom 60% of total households seeing a non-adjusted increase in income of about 300%, with a collective increase in income of about 450% when adjusting for the growth in number of households. Looking at this, house prices would have to be significantly less than half of what they are right now in order to keep things affordable, if it were not for the much lower interest rates. After this mental exercise in looking at what an impact interest rate changes had on just one sector of the economy, we can perhaps better grasp the importance that we should give to rising interest rates here in the US and all over the world. As we can see with mortgage rates, as well as other easily identifiable benchmarks, such as treasury yields, we started seeing an increase in interest rates throughout the economy. In other words, as new debt is taken out and old debt is refinanced, we are looking at an increasing interest rate burden for every dollar owed. 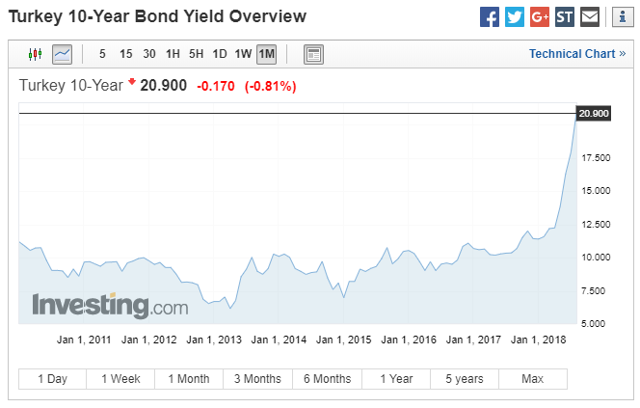 This is not only happening in the US but on a global scale, with perhaps only Japan and the Eurozone being an exception, where interest rates are not rising by much. One could argue that this is something that happens in every economic cycle, but perhaps this time it is different, because we may have reached the point where the global economy's ability to tolerate a significant increase in interest rates may be severely handicapped by the massive growth in debt, which has been outpacing nominal global economic growth on a steady basis in past decades. There is also the danger of rising interest rates due to increasing global uncertainty and upheaval. The breakdown of trade relationships, mostly due to tariffs and sanctions being imposed on a large number of countries by the US, which tends to follow counter-measures is a major factor. There are also tensions between other actors however, which adds to the uncertainty and a perceived need to re-assess risk/reward ratios on global debt. We have economic tensions between the EU and China for instance, as well as between the EU and Russia. A number of countries, mostly in the developing world are in my view either in a severe financial crisis or are close to entering one, including Venezuela, Iran, Iraq, Pakistan, Turkey, South Africa as well as others. Individually, these countries are not large enough to represent a global financial threat in case of default, but put together, they would add up to being one of the ten largest economies on earth. All of them are currently seeing a severe devaluation of their currencies and a spike in interest rates. If we contemplate the potential resulting collapse of Turkey alone, we can quickly conclude that the financial and geopolitical effects could by themselves lead to a new global financial and economic crisis. As has been reported already, EU banks have significant exposure to Turkish debt, so if Turkey was to collapse, these banks would be faced with taking significant write-downs. There are also many questions in regards to who owns Turkish government securities, which are declining in value and could potentially enter default if this situation persists. My guess is that European institutions have a great deal of exposure to Turkish sovereign debt, given the lack of yield in European economies, which led many institutions to seek yield among riskier assets. Perhaps more than the financial exposure, which could itself pose a great deal of risk for the EU economy, there is the geopolitical danger. As we know, the EU was on the brink of tearing itself apart in 2016, due to the migrant crisis caused by hundreds of thousands of migrants crossing from Turkey into the EU every month, until the EU-Turkey migrant deal was struck, putting an end to the flow. At the time it was seen as a deal made out of desperation, as the European electorate was increasingly showing signs of rebellion against the accommodating position of the EU elites towards settling the migrants on EU soil, often forcing countries or communities into taking them against their will, with disregard for protests against their settlement among the local population. There are those who believed that in the absence of a stop to the flow of migrants, the EU project itself was risking disintegration. If Turkey were to implode economically, it would most likely pull out of the deal, which would mean an immediate resumption of migrant flows into Europe. There are currently three million Syrian refugees in Turkey, one million in Lebanon and perhaps as many as another million in Jordan. If Turkey were to implode, countless Turks might decide to join the flow of migrants into Europe. Perhaps millions more from across the Arab world would follow, just as they did the last time, with Syrian fake passports once more becoming a hot commodity on the black market. I personally do not think that the EU would survive a repeat of such a crisis. In other words, the risk premium on EU debt would have to start rising significantly in order to reflect such a reality. Some people will be tempted to believe that this would all play in the hands of the US, as a safe haven destination for money, given that most of the rest of the world is increasingly looking shaky. I don't believe that this is necessarily the case, because either an uncoordinated outcome, or a coordinated move on the part of a number of nations could in fact lead to a run on US treasuries and other debt as well. I will dedicate a future article to the many possible outcomes where US interest rates will not go against the global trend and start rising as well. There are plenty of reasons to expect that this time around the Federal Reserve will not be able to do what many people think that it can do in order to keep rates low. The end-result of the end of the declining interest rates era will be a new period in human economic history, where debt-deleveraging, which many people thought it will start back in 2008, will start in the aftermath of the next global economic downturn, whenever it may occur. 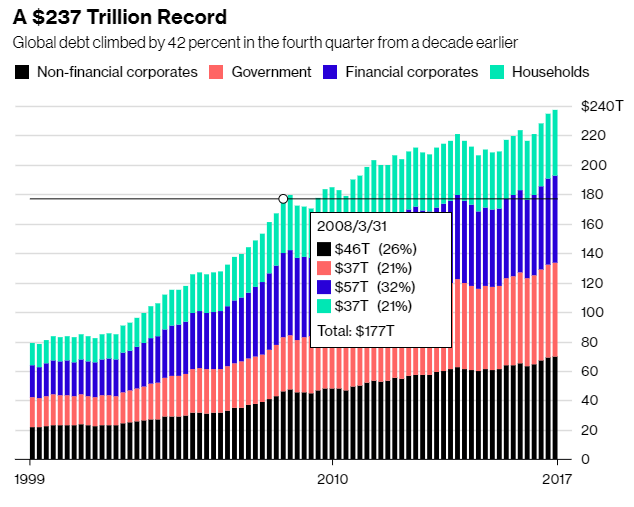 While debt deleveraging seems like a righteous and positive thing, leading to a healthier global economy, I believe it will be a very long-lasting and extremely difficult period in human history, and we are just an overdue economic downturn away from its start.